A picturesque hill town, Bargemon is visible from across the valley in Claviers, or from above on the D25 route to Castellane. The village boasts beautiful gardens, fine homes, shaded streets, large elms, small squares, and numerous fountains. 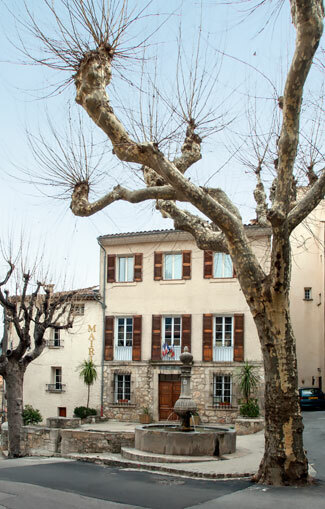 In the center of the main square, Place Philippe Chauvier, stand an enormous elm and a grand fountain. Whether your destination is Draguignan, Claviers, Seillans, or Comps-sur-Artuby, you must navigate around these two venerable landmarks. In this region, the automobile takes second place to trees and fountains. If a tree grows out into the roadway, well, drive cautiously. Just west of St. Tropez, the D559 road splits apart for a few hundred feet to pass around three old trees that in some places might have been cut down. This is a charming characteristic of the hill country of the Var.